Wow, can’t believe that in less than 12 days Christmas is here! Why am I excited? Let’s see – my parents are back in Poland, dad goes to the hospital few days before Christmas to check his heart condition, I’m literally the only Christian around our household to celebrate, my husband has only one day off, probably doing overtime on 26th… Seriously, why I get excited? Oh, I know. Because we’re making that one and a half day a very Polish Christmas. I know that everyone thinks their Christmas are the best, the warmest, the happiest, especially here in America when everyone around makes it BIG, their homes are covered in lights with fake snowmans outside but I wish I could share with you a little bit of my traditions, food, nice memories of our first Christmas we could be together and those little joys we were able to have. 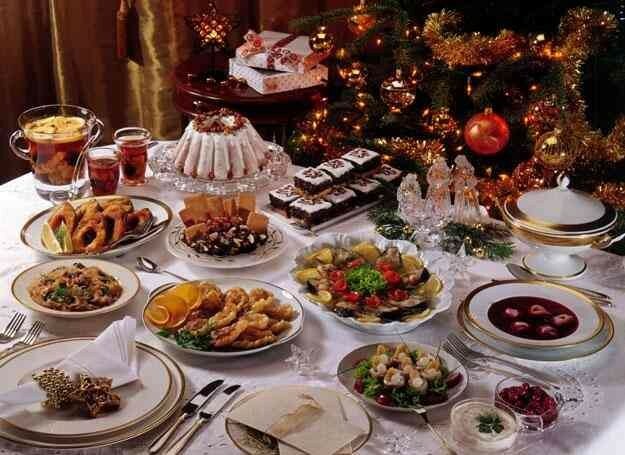 In Poland celebration starts at the evening of 24th December which means that day we all become foodies. A traditional meatless 12-dishes Christmas Eve Supper is served on Christmas Eve before opening gifts. This is known as the “Holy Meal“. The table is spread with a white cloth symbolic of the swaddling clothes the Child Jesus was wrapped in, and a large white candle stands in the center of the table symbolizing Christ the Light of the World. Next to it is a round loaf of bread symbolizing Christ Bread of Life. Hay is often displayed either on the table or as a decoration in the room, reminiscent of themanger in Bethlehem. The twelve dishes (which differ by nationality or region) symbolize the Twelve Apostles. Meat is forbidden until midnight, but eating fish is a tradition. Every year before Christmas everyone is lining to get their own carp. Honestly we had problems with making it up to 12 different dishes because there was not enough people to eat it, even with our dog’s help. My favourite dishes are borscht with mushroom-sourkraut dumplinds and uszka – it literally means ‘little ears’ because those tiny dumplings are shaped as an ear. I can have those 3 dishes and I’m satisfied with my Holy Meal. Seating to the table makes me think little bit of Chinese order – you either go by age or by ‘rank’. By age to make you ‘go away from this world by this order’ meaning child won’t die before parent etc. and by rank to start a meal. Isn’t that really similar? I think that’s one of my favourite traditions, it’s really beautiful, kind and shows the spirit of God’s love. There’s always an empty seat during the Christmas Eve Supper for people lonely, hungry, for your old neighbour who sits alone that they. Go and invite. It’s also a symbol for people who cannot be with us because they are far away or they are dead. In the past families used to wait until a first star shows up at the sky to start a meal just like the time when Three Kings saw a star that guided them to Jesus. 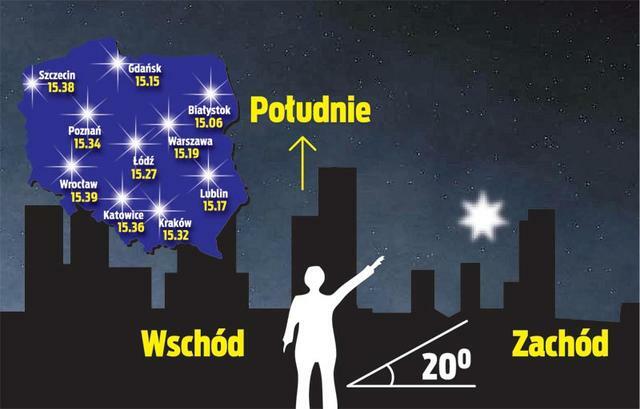 Some of the newspaper even make a chart what time in specific place in Poland you will be able to see it. When I was a child there was a rule you shouldn’t eat unless you’re pregnant, little kid or older person, diabetic etc. until the Christ Eve Supper. And because at that time my dad was perfectly healthy he could only see me eating things and as soon as it got dark he asked my mom to start cooking. By the time First Star was in the sky we went out to look for it as a time of opening the gifts. We don’t have ‘Boxing day’ so, lucky us, we can play with our gifts much faster. What made me upset and question the existance of Santa was that every year when we went out my mom was doing dishes instead of looking for Santa. You have a freaking Santa in your living room and you do the dishes?! I will have to come up with a better story for my child. The breaking of the Christmas wafer is a custom that began in Poland in the 10th century and is practiced by people of Polish ancestry around the world . It is considered the most ancient and beloved of Polish traditions. It teaches you that you should share even your last piece of bread. Before partaking of the Christmas Eve meal, the family gathers around the table. The eldest member holds a large wafer and breaks off a piece to begin the ritual. The remaining wafer is passed on to another member while a prayer for loved ones is said. This continues until everyone at the table has a piece of the wafer. Finally, the family members consume their share quietly. Personally I hated it because every year I need to think of different wishes for everyone and once I’m done I’m reliefed. Literally, I breath out all the air I had and I feel joy inside. It was also a little bit of culture shock for my, at that time boyfriend now husband, who had no idea my family is so warm and huggy. Imagine a shy, tiny, anti-touchy Asian man who met your parents recently and on the other side your very open parents who keep hugging him, kissing on the cheek with ‘best wishes’. First hug scared him so badly his eyes were bigger than 5PLN. And that’s quite big. Second attack was from my mom – 3 kisses on cheeks, left, right, left, then a bear hug. And my husband just patted my mom on her shoulder. So Polish girls – before you make your boyfriend/fiance/husband/friend to share the wafer prepare them for hug-festival. Same was with his mother last year when she went to Poland to have some small family meeting. My husband is not touchy but she is far beyond that. Of course Sing thought it will be so fun not to prepare my MIL for upcoming touch-terror and just let my mom do 3 kisses on cheeks with a bear hug, even my dad gave her 2 kisses on every cheek. I laughed that it’s probably more than she got in last 15 years. Depends on the region but beside singing Christmas carols some people took the leftover food, put it at the table or bench next next to the ashes for people who are gone and in the morning they checked if anyone came and who it could be. Some other people used the leftover food to give it to the animals because it’s told that during midnight animals can speak human’s voice, especially cows since they were close to Jesus when he was born and as a reward they got ability of speaking for one night a year. What would your pet say? Biscuit would probably pop out with ‘Human, we need to talk. My litterbox is empty again, I think someone steals my poop’ or ‘What’s the deal with the red dot?’. Pasterka is a Midnight mass celebrated during Christmas between 24 and 25 December by Roman Catholics across Poland. A close translation of the name would be the “Shepherds’ Mass“, in reference to the Biblical shepherds, who were visited by an angel and told of the birth of Christ. 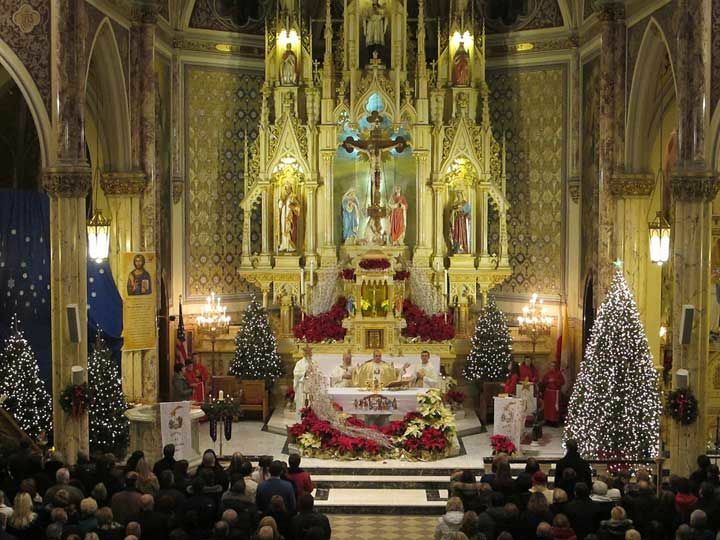 During the Pasterka mass, Polish people sing traditional Christmas carols in the spirit of joy. There’s also mass at 10PM for children or old people who just cannot wait until midnight. In my church children come up dressed up as kings, shepherds, even Maria or Joseph! Play old instruments and they are actually a part of the whole event. I don’t want to show off but I was the cutest angel. Then I grow up and now I can play a cow. I always went there with my mom, because every year my dad used to feel sick aroun 8 or 9 PM and when we came back from the Church he looked perectly normal eating ANOTHER piece of cake. Even my husband went every single time forcing our MIL to go as well, but my dad as far as I remember went there only once, in the year my dad survived his heart attack because ‘he has enough to be thankful’. I really appreciated my husband being with me even thought he didn’t understand a word, same with MIL. They even went down on their knees and I know for them it’s a really big thing. People kept staring, having one or more Asian in the church is quite unusual so my mom had to give a ‘death-stare‘ to anyone who was looking. Yay, love and peace everyone. Although I must say my mom in law had fun looking on those ‘blond babies’ and keep pointing at us and saying ‘BB’. That’s a the special exhibition of figures representing the infant Jesus, his mother Mary, and Joseph. Other characters from the nativity story such as shepherds andsheep, and angels may be displayed near the manger in a barn (or cave) intended to accommodate farm animals, as described in the gospels of Luke. A donkey and an ox are typically depicted in the scene, as well as the Magi and camels belonging to the Magi described in the Matthew. 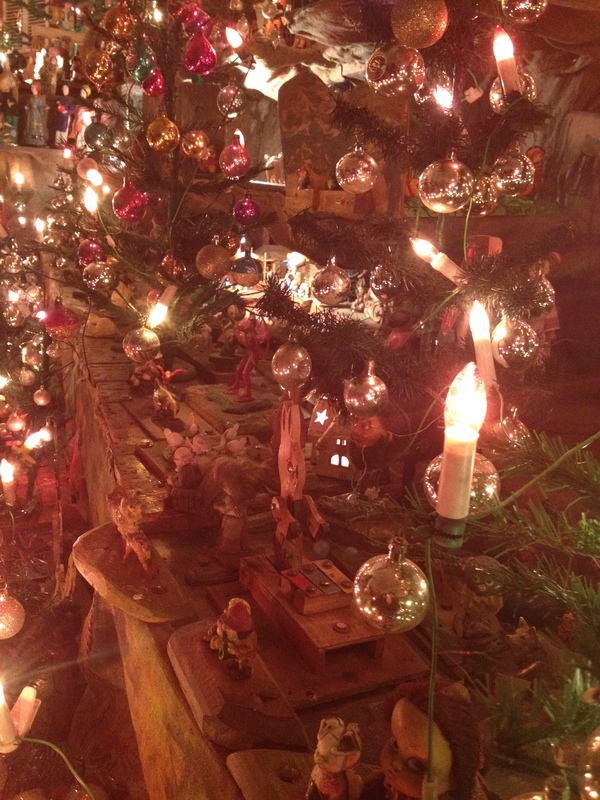 Especially Polish city Krakow is know for making beautiful nativity scenes dated back to 19th century! At times subject-specific puppets or figurines were and are being added to illustrate elements of Polish culture, ranging from historical figures like winged hussars and Tadeusz Kościuszko, through the legendary sorcerer Pan Twardowski and Dragon of Wawel, to contemporary politicians or artists. In the 18th century the spread of such non-religious content led to a ban on more extravagant nativity scenes in some Polish churches; following the ban, the performances evolved into a true expression of folk art. They are so amazing there are competitions for the most beautiful one! I think I wouldn’t be able to pick my favourite one! Those two days are usually days off for everyone beside police, hospitals etc. that’s why I got upset knowing that my husband has to work on 26th. In my family we use those days to spend more time together, eat meaty, big Christmas breakfast and go to the church, around the city center then eat more and later eat again plus enjoy our gifts. Or enjoy my dad’s grumpy face. 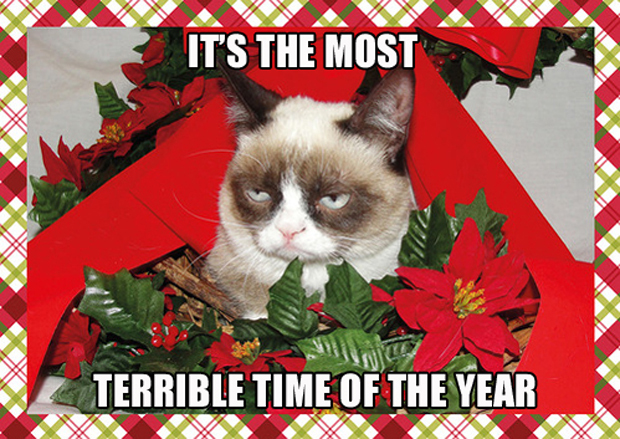 He was grumpy before grumpy cat was cool. He can pick his gift, show you exactly which model, color etc. he wants… and still not be happy about it. Is there any tradition in your country same as Poland? Share your Christmas experiences, memories and traditions! I find your customs very interesting, especially the Christmas Eve meal. It is very symbolic of the true meaning of Christmas! Thanks for sharing! why do other countries in europe such as russia have christmas on a different date than dec 25th? Amazing pictures and such beautiful traditions. Heart-warming. Merry Christmas! 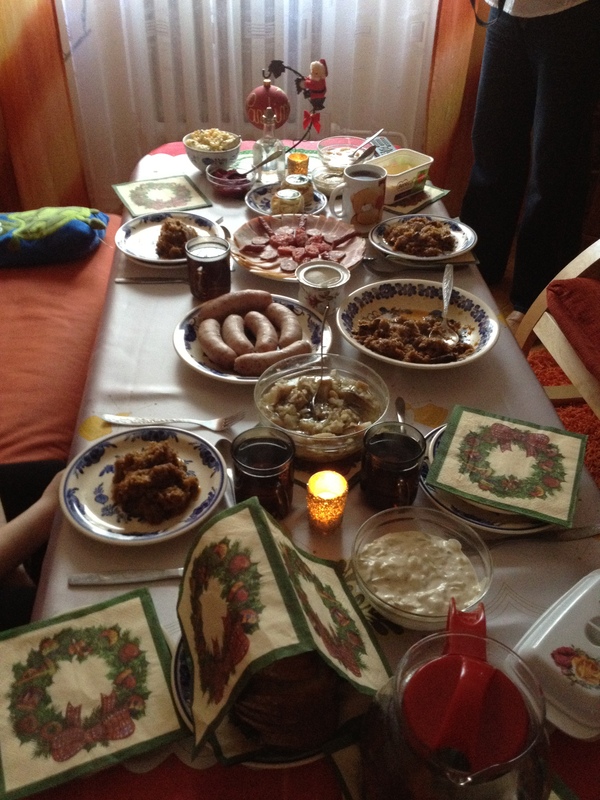 You did a wonderful job of describing a Polish Christmas. I laughed when I read about sharing the wafer and the kisses and hugs given to your husband and mother-in-law. Beautiful photos of the manger scenes. Thanks for sharing. I love the empty seat tradition! What a wonderful way to give. 🙂 Merry Christmas! It was hilarious how your dad also checked the whole house! Sounds like my father! Merry Christmas!!! the 12-dishes Christmas Eve Supper sounds so grand! Having both Austrian and Polish ancestors, so many memories reawakened. Very entertaining post! I love the tradition of the empty chair. And being vegan I would enjoy the meatless meal on Christmas Eve. Beautiful traditions. And how fascinating — your intercultural marriage, that is. Well done! Wow, what a thorough article! You have a lot of traditions for Christmas and a 12 dishes meal sounds delicious (although I’m sure it’s a lot of work and stress for the people who have to prepare it). The tradition with one seat left empty is great. In Austria, some people also eat carp for Christmas Eve (I think it was carp), and others (like my family) eat sausages with sauerkraut and potatoes. There might be some other side dishes like salads, but all in all it’s a very simple meal. My family used to sing Christmas carols after dinner and read the Christmas story. Then we would start opening the presents. If you’re Catholic, you might also go to midnight mass. It’s interesting to get to know from your blog about custom in Poland and I love the 12 different region or countries dishes in symbolizing the Twelve Apostles. My heart warmed about the Empty Seat and how your family let the old lady come in and celebrate the feast with your family ❤ It's the season of sharing. 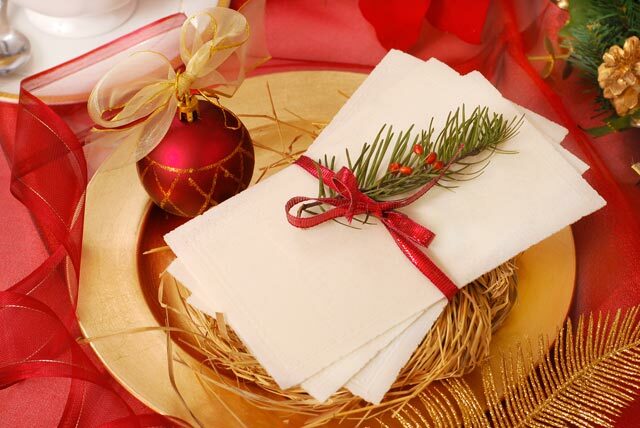 Wonderful post…the Christmas eve meal description was great, left me longing for home. Enjoy the holidays! Oh my, meatless portion of Christmas? So enticing as a vegetarian. I may have to visit Poland during Christmas time then. 🙂 Beautiful pictures! This is awesomeeeee! I wish I would experience an authentic Polish christmas too!! Thanks lots!!! That will be great!! 😀 I will write you an email soon!! !